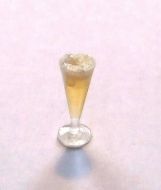 A Single Venetian Stemmed Wine Glass, used in Tudor households. A high status item for any Tudor household. 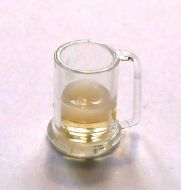 A Beer Mug, half filled with light beer. 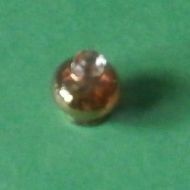 A Cranberry Glass Bon-Bon Dish. 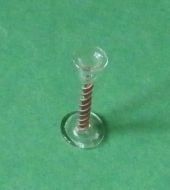 A Cranberry Glass Perfume Bottle, in 1:12th scale. This can either be a Classic Gin and Tonic with ice, a lemon slice and straw, or a Mojito, without the mint leaves. 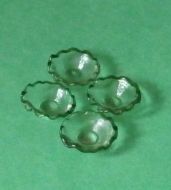 Four Shallow Glass Bowls, can be used in a Victorian or Modern kitchen or dining room. 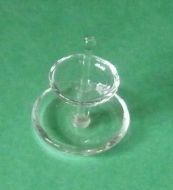 A Clear Glass Two-Tier Cake Stand. 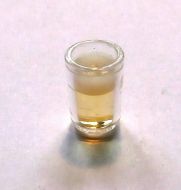 A Straight Glass filled with Lager.